Compressed gas suppressants such as HFC-227ea and 3M™ Novec™ 1230 Fire Protection Fluid will not stall a diesel engine. If a fire breaks out aboard a diesel powered vessel, the engine(s) must be shut down prior or during the discharge of the Fireboy suppression system to effectively extinguish the fire. Continued engine operation may remove the agent, lowering the concentration required to effectively extinguish the fire, making an Engine Shutdown System necessary. NOTE: Each system includes two (2) individual relays for propulsion engines for redundancy. 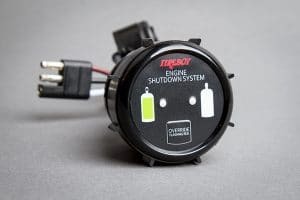 Each engine shutdown display unit comes with an integrated alarm horn, charged / discharged lights and an override switch for restart or control of auto-shutdown. Additional units and wire harnesses are available for a second station. 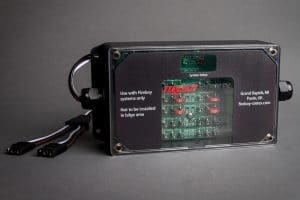 Featuring an ISO 54 Enclosure, fuses, internal terminals, Heyco™ wire connectors, along with a see thru cover to easy observe circuit board mounted L.E.D.’s which indicate circuit board and Fireboy Extinguisher status, or that a fault condition exists. Non-energized relays. A combination of models including 6, 8, and 10 circuits. 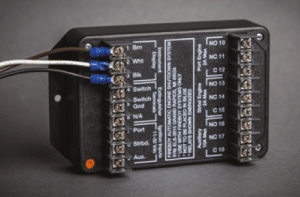 Select from a combination of relays; 30 amp, (operating range 100 mA to 30 amp), 10 amp, (operating range 100 mA to 10 amp) and 2 amp gold plated relays, (operating range 10 uA to 2 amps). All models include a square black (DU-SBH-20) display with Water Resistant Display featuring multi-colored L.E.D’s. for the helm station with override function. 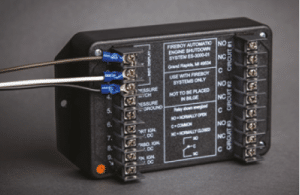 Engine circuit relays feature an operating range of 10 uA to 2 amps. Auxiliary relays have an operating range of 100mA to 10 amps for the shutdown of generators, dampers, louvers, and other types of related engine room equipment. All ELS models are 12/24/32 VDC compatible with a choice of either a round (DU-RBH-20) or square (DU-SBH-20) helm display. 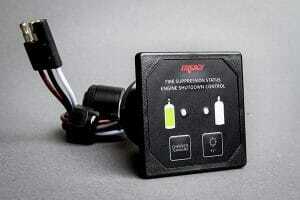 Combination of 2 amp gold plated relays for low current equipment and electronic engines, plus standard 10 amp relays. Available for shutting down up to eight circuits with engine circuit relays featuring an operating range of 100 mA to 10 amps. 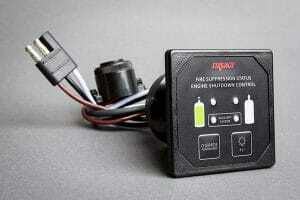 Operates in 12 or 24 VDC models. The ES model includes a choice of either a round (DU-RBH-20) or square (DU-SBH-20) helm station display. Deluxe Helm Display, Membrane Switch, Remote Horn, LED Display, Square Only. Includes 3ft. cable. Deluxe Helm Display with Gauge Body, LED and Color Graphics. Includes 3ft. cable. Deluxe Helm Display, 2 Systems: Control Primary, Monitor Secondary. Remote Horn, LED Display, Square Only. Includes 3ft. cable.